I actually ummed and ahhed over reviewing this book. I adore Oyvind Torseter's work, and have all of his books, but this one was a little outside both my comfort and 'like' zone. Perhaps this is a good thing. I'm not sure. Liking books is, of course, so subjective. As an author myself, I understand this well. It's not that I dislike The Heartless Troll. I guess it's just not my kind of book, and that's okay, because it will be someone else's kind of book. 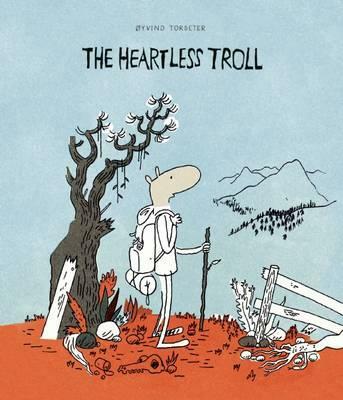 Based on a Norwegian fairytale, The Troll with No Heart, Torseter uses an opening page to fill us in on the background to the tale. Six princes leave their castle to find love, leaving their youngest brother, Prince Fred, behind. They meet six princesses, and on the way home, are turned to stone by a mountain troll. When the princes fail to come home, Prince Fred sets out to find them. With a little help, he enters the cavernous mountain home of the troll to discover a trapped princess--and of course, the terrifying troll. In order to escape, and free the princess, he must find and destroy the troll's heart... but first he has to find it. A cartoon-style graphic novel told with scant text and speech bubbles, the storyline and imagery careen between lighthearted scenes through moderately dark to openly disturbing. The troll is pretty much full horror, so a warning to adults who hand this book to the very young--there could quite possibly be nightmares. Imagery is loose and collage-like, also careening between artistic styles, with a superb colour palette and fascinating construct. It's clear this book has been a labour of love for Torseter and that he's had a lot of fun creating the work in deeply satisfying ways. I can fully appreciate his artistic license and the beautifully-stylistic way he has constructed the pages, including typography. I think the cover belies the content of this book. The interior imagery will resonate with older kids who like Goth or horror, and those who adore abstract and alternative art will swoon. The book is marketed to 10+ but I have recommended it for 12+, and to those who aren't scaredy-cats, like me.